The domain within your query sequence starts at position 133 and ends at position 235; the E-value for the BACK domain shown below is 7.34e-27. 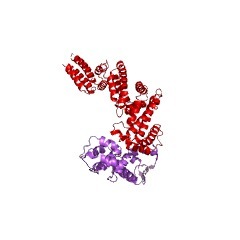 The BACK domain is found juxtaposed to the BTB domain; they are separated by as little as two residues. This domain is found associated with (IPR000210) and (IPR006652). BTB (broad-complex, tramtrack and bric a brac) is a Kelch related domain, also known as the POZ domain [(PUBMED:16207353)]. 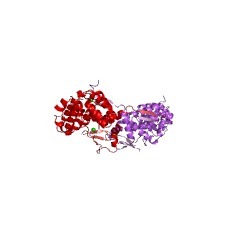 BTB proteins are divided into subgroups depending on what domain lies at the C terminus. Despite the divergence in sequences, the BTB fold is highly conserved. 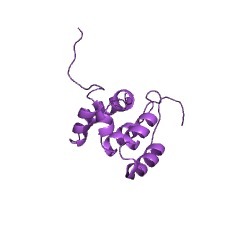 BTB-Kelch proteins have Kelch repeats that form a beta-propeller that can interact with actin filaments [(PUBMED:15544948)]. 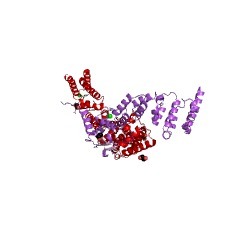 BTB and C-terminal Kelch (BACK) together constitute a novel conserved domain, which is thought to have a possible role in substrate orientation in Cullin3-based E3 ligase complexes. Four domains, namely the BTB domain, a kelch domain, a BACK domain, and an intervening region (IVR) make up the aryl hydrocarbon receptor (AHR); a ligand-activated transcription factor [(PUBMED:16582008)]. 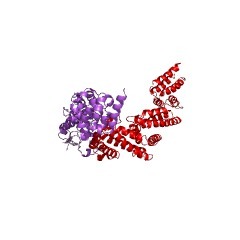 This entry represents the domain associated with BTB and Kelch. There are 27812 BACK domains in 27689 proteins in SMART's nrdb database. Taxonomic distribution of proteins containing BACK domain. This tree includes only several representative species. The complete taxonomic breakdown of all proteins with BACK domain is also avaliable. Click on the protein counts, or double click on taxonomic names to display all proteins containing BACK domain in the selected taxonomic class. 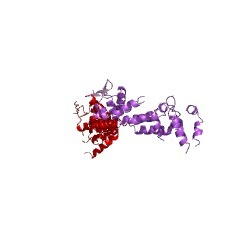 The BACK domain in BTB-kelch proteins. A novel conserved motif--the BACK (for BTB and C-terminal Kelch)domain--is found in the majority of proteins that contain both the BTBdomain and kelch repeats. Many kelch-repeat proteins are involved inorganization of the cytoskeleton via interaction with actin andintermediate filaments, whereas BTB domains have multiple cellular roles,including recruitment to E3 ubiquitin ligase complexes. The identificationof the BACK domain in BTB and kelch proteins, and its high conservationacross metazoan genomes, suggest an important function for this domainwith a possible role in substrate orientation in Cullin3-based E3 ligasecomplexes. This information is based on mapping of SMART genomic protein database to KEGG orthologous groups. Percentage points are related to the number of proteins with BACK domain which could be assigned to a KEGG orthologous group, and not all proteins containing BACK domain. Please note that proteins can be included in multiple pathways, ie. the numbers above will not always add up to 100%.